The bite was slow in the morning but began to pick up at around 1:00pm. We stayed out a little bit longer than planned since the bite started to pick up later in the day. 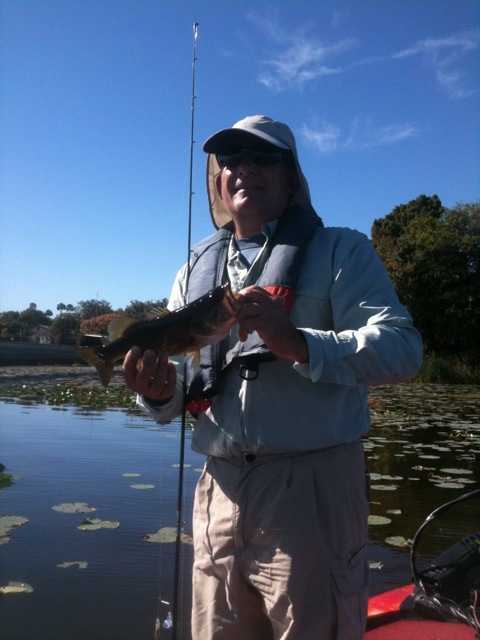 Mr. Ford caught several fish, the largest being approximately 4lbs and another nice fish weighing at about 2 1/2 lbs. He hooked a large bass but it got off at the boat after allowing us to get a good look at it, we would estimate that fish to be about 6 or 7 lbs! We were glad that we got to see it but sure would have liked to land it in the boat. Mr Fords guest hooked several fish and had one nice fish jump and throw the hook that was a good 4 pounder. A front moved in the night before we went out which made the fishing slow, but we had a fun time on Orange Lake. All fish were caught on buzz baits and plastic worms.